2ManyOpenTabs – Page 2 – The hectic life as a mom, wife, daughter, + writer equates a continuous and simultaneous running of all cylinders. It occurred to me the other day, while surrounded by brimming piles of overstuffed laundry baskets, thousands of teeny-weeny pieces of legos strewn across the house like sprinkles atop an ice cream cone and a laptop whose cursor was condescendingly blinking back at me, just why, as a working mother, balance is so difficult to achieve — something by which finding the Holy Grail or the ever-elusive Fountain Of Youth might be more easily attainable. But to answer this question, it’s imperative to take a stroll marathon back down memory lane. Once upon a time, when kids were a mere dream and my own comfort and happiness were an actual consideration, I had what I would have considered, a really balanced life. I worked hard and I played hard. I allotted ample doses of ‘me’ time as well as time for my friends and family. I focused on my professional achievements as well as personal ones. I read, watched, and wrote till my heart was content. I was for all intents and purposes, content and balanced, living a life peppered with variety and harmony. But looking at that former life, however, it’s become blatantly obvious why my life is so out of balance now… I’m attempting to apply the same subset of expectations to a life that doesn’t even begin to resemble to my former one. I’ll never again exist in a world steeped in such freedom or solipsism. So why then, am I looking to it for answers on how to achieve it now? Just as my role and responsibilities have changed drastically with the addition of each child, so too, does the need for my expectations in an effort to fully comprehend what balance actually looks like within the confines of such framework. Over time, a seismic shift has occurred, by which most of my day is spent tending to the needs of my children. Therefore, balance can’t mean having as much freedom as I do obligation, or dedicating as much time indulging my own desires (or even the occasional solo trip to the bathroom) as I do those of my children’s. The scales will always be tipped in the direction of my kids, and after all, that’s what parenthood is all about, rendering the theory of balance to be truly what you make of it and not at all about the actual evenness of reality. Motherhood catapults you into a new balance which while certainly does not favor me, overall, I favor it. I am a writer, therefore, my relationship with words has always been an intimate one. I make sense of life based on the words I use to describe it. They help me define and articulate my thoughts and have long since been my tool for healing and providing comfort. To me, words are the window to my world, and yet ironically on one of the most important days of my life, words were noticeably absent. 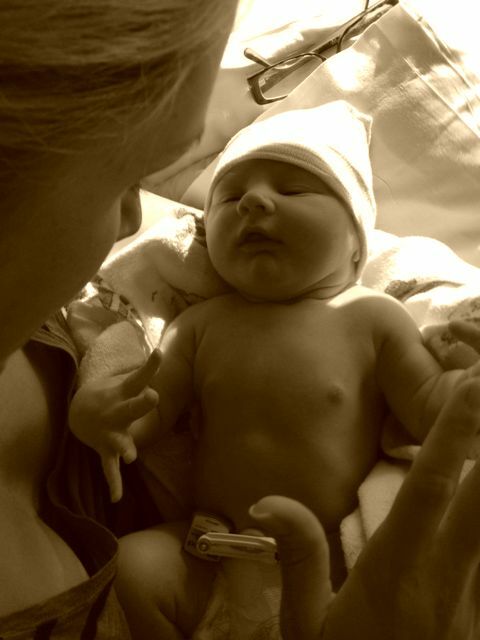 The inescapable loss for words on the day I first held my son was something I’d never experienced. His beautiful, rhythmic breathing left me mesmerized as I held him against my chest and found myself in a trance-like state of just staring. This perfect being, my perfect being. The cosmic union of sperm and egg stared up at me with almond eyes as I caressed his soft, buttery skin. His intrinsic understanding that I was his entire world, the lifeline to everything, and right then and there, him, mine. And, it was in this moment I said nothing. No words. Not a single adjective could adequately convey my feelings because in that place, words were not enough. They couldn’t explain the majesty of what lay before me, the magnitude of love I had for him. The life I’d wanted, created, carried and fought to bring into this world now peacefully grasping my finger. He instinctively nourished his body from mine and all I could do was stare back. That which always provided comfort and afforded me the ability to express myself was now somehow completely and woefully inadequate. The typical flood of words, which pulse through me in clips and phrases like blood in my veins had left my body entirely, and in that moment I was simply one with him, words excluded. And as if that weren’t enough, I actually fantasize about applying those same obsessive methods for organization to real life. 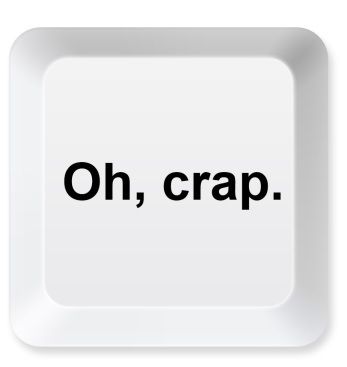 For example, since most days are spent writing, my love affair with Edit:Undo has reached epic proportions. It does my Type-A self good as I go through the lovely little sequence of restoring order. But what if we could use the same method for remediation for life’s mishaps? Forgot your computer at home for an important meeting? Edit:Undo. Left the kid’s lunches on the counter when leaving for school? Edit:Undo. Stepped on the 14th lego of the day? Edit:Undo! And in this day and age with 3D printing and companies shipping via drones, it seems that at the very least, there should be an app for that, no? In the meantime I’m not saying that being over-the-top, fastidiously organized is the best way to be, but I kind of am. Whoops….Edit:Undo. Ever heard the saying that if you can’t find the humor in life and its inevitable and otherwise host of unsavory situations, then you’ll pretty much be miserable for the whole duration of it? Yep, well that’s kind of how this blog got its start. As a mom of two under 4, a wife, a daughter, and a social media strategist and content writer for several companies and start-ups in the Bay Area, my life doesn’t contain much down time. And I’m not playing the woe-is-me card AT ALL, it just goes with the territory (a territory that I happen to love, btw), but one in which can be pretty difficult to navigate some days. My life literally always has too.many.open. 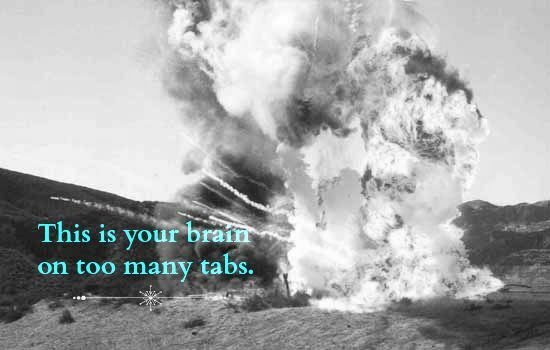 tabs. Take right now for instance, open right now on my computer I have (not in order of importance, of course): ‘The 10 best spaghetti squash recipes’; ‘Take action, save the bees petition’; A Special new baby food purée ice cube trays; A pair of Vintage Collection Nikes I’m coveting (I need to run more); Dropbox; Facebook (of course for both me and my clients’ pages); ‘Are BPA-free cans healthy?’ article; An MS Word Doc; ‘6 stretches for a sore neck and back’; 3 Excel Spreadsheets; A new skincare line I know I need, but have been putting off; Huffington Post; Activities for 4 year-olds; Pinterest; Clients’ webpages I’m editing; WordPress; And another damn article about one of the Kardashians (Why do I even care?). And it’s only 9:30. AM. Whoa. But again, if you can’t find humor in the fact that I’ve set up my day (and expectations) to make a spaghetti squash in my brand-new nikes, just having washed my face with my fab new skincare regimen while checking the current news, editing work for my clients, saving bees from extinction, writing content with my right hand whilst gluing a popsicle stick for an arts n’ crafts project for my 4-year old with my left and whipping up a batch of baby food purées in those new designer trays I bought, then I’m in the wrong job. Because that’s life, or that’s my life at least, and as much I do enjoy downtime without the stress of multi-tasking, let’s face it: that comes once in a blue moon. Whoops, just remembered I forgot to do my neck + back stretches… I guess that one will have to wait til’ I have at least 1 free hand. The next blue moon perhaps?